← For great food and great ambience – Cafe Britannia! I joke that Marathi cuisine could give the old Atkins diet a run for it’s money, given the importance of pulses in our cuisine. 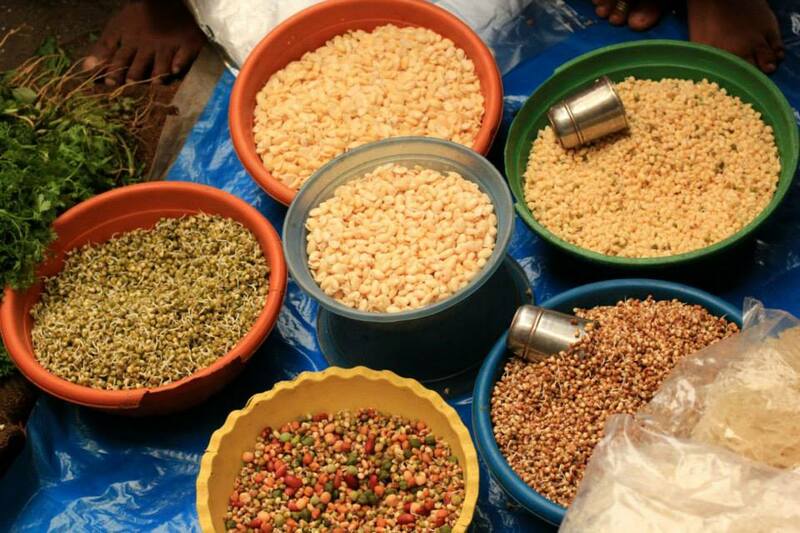 Matki (moth beans), Moong/mung (green gram), chawli (black eyed peas), vaal/dalimbi (bitter field beans) and double bean are commonly used in many preparations at home. Both my grandmother and mother would make this often and it’s really quite simple to cook. In most wet markets in Mumbai you will always find one vendor selling sprouted pulses. Or you can simply sprout them at home. I typically soak the pulses overnight, then drain the water the next morning and keep the pulses wrapped in a tea towel to allow them to sprout – typically 1-2 days. Once they’re sprouted, you can cook them to make them soft and add a simple tempering of cumin/mustard seeds, curry leaves, turmeric powder, salt and jaggery and add onions and/or tomatoes. 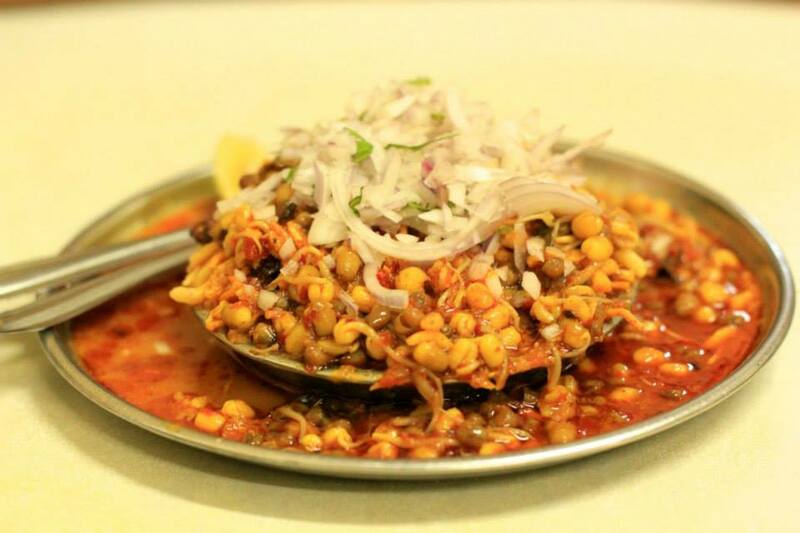 A very classic dish made with pulses is of course Misal, found in many restaurants in Mumbai. The picture below is a spicy version at Tambe Arogya Bhavan in Dadar. You have a version of this with yoghurt which is quite nice, or simply eat it with pav (soft bread). At home I like to add a lot of stuff into my misal – fried garlic, sev (fried gram flour), coriander and yoghurt chutney and peanuts, topped with fresh coriander and coconut and a generous squeeze of lime juice. It tastes delicious and best of all it’s very nutritious. This entry was posted in Marathi cuisine and tagged protein, pulses, salad, sprouts. Bookmark the permalink.